National multidisciplinary design firm HGA, which has created innovative and award-winning workplaces for numerous leading tech companies including LinkedIn, the ABB Group and SAP Software Solutions, recently completed the interior design and build out for the headquarters for Milwaukee-based software company Digital Measures. 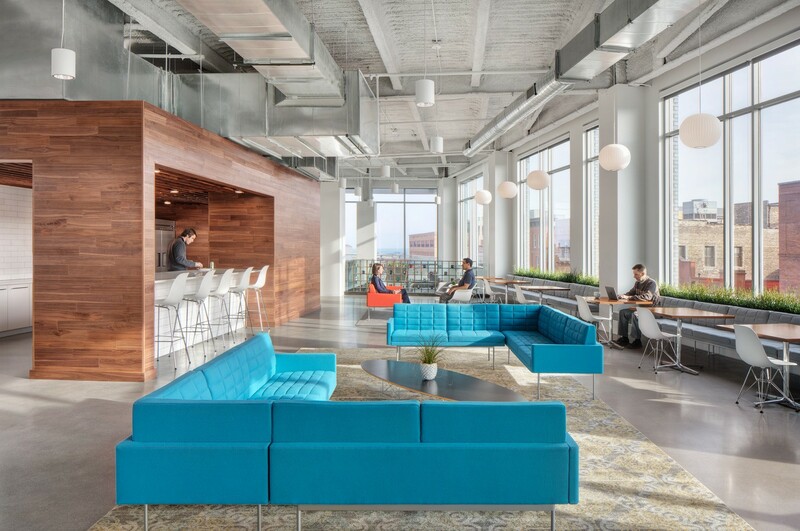 HGA’s survey revealed that Digital Measures employees were interested in accessibility to daylight and views, acoustics, a conference space large enough for community meetings, accommodations for staff members ranging from Generation Z to Baby Boomers, and the desire for a rooftop terrace with views of the Milwaukee and Lake Michigan. The new offices take up the top two floors of the Mercantile Building within Milwaukee’s bustling Third Ward. Because of the building’s new addition, Digital Measures’ two-level office space spans two building types: the existing structure’s pink brick and heavy timber, and the addition’s drywall-covered steel structure and exposed metal decking. HGA united the two aesthetics by painting the brick and wrapping the timber columns in drywall. To bring light and views into the new office, HGA designed an open floor plan with floor-to-ceiling windows, glass walls and doors that allow daylight to penetrate the central spaces. Glass doors lead to the new rooftop patio, which serves as a workspace and a prime location for meetings and events. An atrium spanning the fourth and fifth levels in the southwest corner brings additional light into offices and gathering spaces. To accommodate different working styles, HGA’s design team mitigated noise concerns by programming in small, private spaces for all staff, creating conference rooms in a variety of sizes, and incorporating a collaborative work, entertaining and meeting area adjacent to a large, open kitchen. The entrance to the office shows off the company’s culture but also its connection with universities. A “mug wall” showcases coffee mugs from campuses visited by the Digital Measures’ staff—a creative legacy of the company’s successful partnerships developed and maintained over time. Near the front door is a green wall of live moss that measures 9 feet high by 7 feet wide. 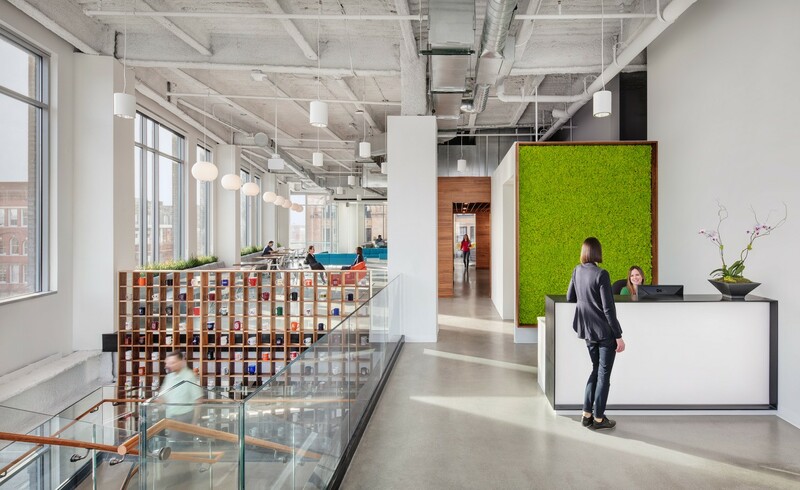 This greenery in the new reception area brings an environmental element to the office’s materiality, which includes polished concrete floors, walnut wood accents, steel and glass. While the fourth level houses reception and offices, the fifth floor is devoted to amenity space for conference rooms, the kitchen with bar and collaborative space, and the rooftop patio. As it has for its other clients, HGA utilized its expertise in designing brand-supportive, creativity- enhancing, flexible and collaborative workplaces for companies in software design and implementation.